Event Description Glanbia Performance Nutrition’s decision to go Zero Landfill at all Manufacturing and Warehouse Operations was made by the GPN EHS Steering Team and is the cornerstone of the GPN Environmental Sustainability Program. 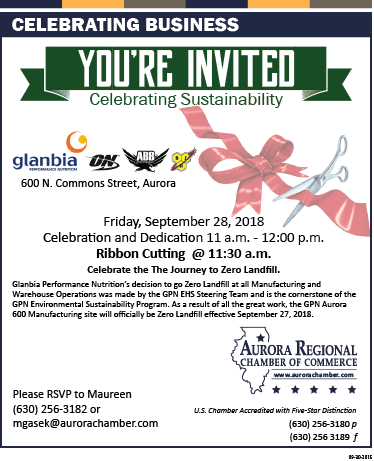 As a result of all the great work, the GPN Aurora 600 Manufacturing site will officially be Zero Landfill effective September 27, 2018. Celebration and Dedication 11 a.m. - 12:00 p.m. Celebrate the The Journey to Zero Landfill.